Experiencing a performance at the former Königliche Hofoper not only means enjoying the traditionally excellent conducting and ensemble, but also a visit to one of the world’s most beautiful opera houses. The »Enchanted Castle« was commissioned by Frederick II from his friend the architect Georg Wenzeslaus von Knobelsdorff. Construction began in July 1741 on what was intended to be the first part of a Forum Fredericianum. A full ten months before its actual completion the monarch’s impatience precipitated the opening of the Hofoper with a performance of Carl Heinrich Graun’s »Cleopatra e Cesare« on 7 December 1742. This event marked the beginning of the successful 250-year-old cooperation between the Staatsoper and Staatskapelle. By contrast to the Staatsopernchor, which was professionalised only in 1821 after decades of making do with lay chorister from local higher education institutions, the Königliche Kapelle was already over two centuries old at the time of its formal inauguration. Its roots go back to the 15th century, but it was first officially mentioned as the Kurfürstliche Hofkapelle in 1570. In 1842 Gottfried Wilhelm Taubert instituted the still ongoing tradition of independent and regular symphonic concerts. In the same year Giacomo Meyerbeer succeeded Gaspare Spontini as general music director, and Felix Mendelssohn Bartholdy conducted the symphonic concerts for a year. In the night of 18–19 August 1843 the Lindenoper – which had meanwhile been merged with the Nationaltheater to form the Königliche Schauspiele – burned to the ground after a performance of the military ballet, »Der Schweizersoldat«. It was rebuilt by Carl Ferdinand Langhans and opened in the autumn of the following year with Meyerbeer’s »Ein Feldlager in Schlesien«. 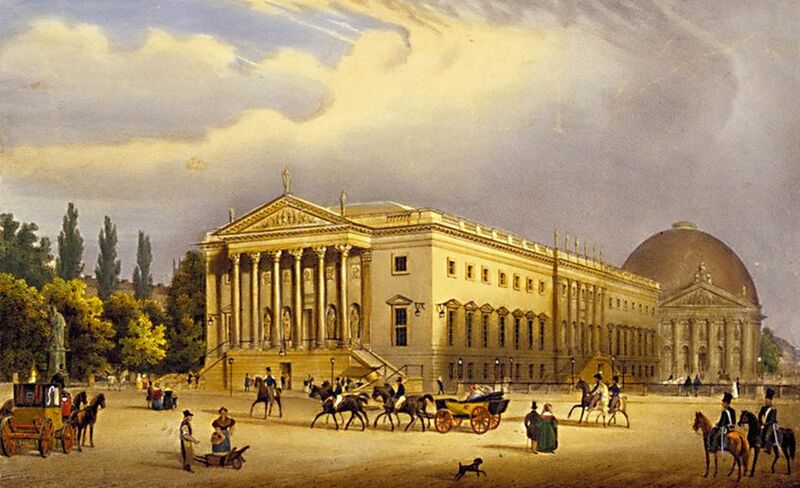 One of Berlin’s 19th-century highpoints was the first performance in 1821 of Weber’s »Der Freischütz« in Karl Friedrich Schinkel’s newly built Schauspielhaus on the Gendarmenmarkt. Otto Nicolai’s »The Merry Wives of Windsor« was first produced at the Lindenoper in 1849, with the composer conducting. Towards the end of the 19th century the opera house attained international fame through conductors such as Joseph Sucher, Felix von Weingartner and Karl Muck, and in later years Richard Strauss and Leo Blech. After the collapse of the German Empire in 1918 the opera was renamed the Staatsoper unter den Linden and the Königliche Kapelle became the Staatskapelle Berlin. The 1920s saw Wilhelm Furtwängler, Erich Kleiber, Otto Klemperer, Alexander von Zemlinsky, Bruno Walter and many others at the conductor’s stand. In April 1928, having undergone a complete renovation with the introduction of a rotating stage, trap room and wings, the Lindenoper reopened with a new production of the »Magic Flute«. In the same year Feodor Chaliapin and the Diaghilev Ballet gave guest performances under Ernest Ansermet. After Hitler’s seizure of power all Jews were dismissed from the ensemble. Otto Klemperer, Fritz Busch and many top soloists went into exile. During the Third Reich the chief conductors were Robert Heger, Johannes Schüler and Herbert von Karajan. It was in 1944 under Karajan’s baton that the first stereo recording was made. The Lindenoper had been increasingly devoted to contemporary composers since the end of the German Empire. In 1925 Alban Berg’s »Wozzek« was premiered by Erich Kleiber in the composer’s presence. Kleiber also conducted the first performances of Darius Milhaud’s »Christophe Columbe«, and the »Symphonic Suite« from Alban Berg’s »Lulu«, whereupon the Nazis provoked a scandal and Erich Kleiber was also forced into exile. 1938 saw the first performance of Werner Egk’s Peer Gynt, with the composer conducting. During World War II the opera house was twice completely destroyed by bombing. Rebuilding was quick the first time, but the second took much longer. Both times, 1942 and 1955, the Deutsche Staatsoper Berlin, as it was renamed in 1945, opened with Wagner’s »Die Meistersinger von Nürnberg«. Despite the building of the Berlin Wall in 1961 and the restrictions that followed, the Staatsoper managed to retain its international reputation under its artistic directors Hans Pischner and Günter Rimkus, building up an extensive classical and romantic repertoire together with contemporary ballets and operas. The series of first performances continued with Paul Dessau’s »Das Verhör des Lukullus« (1951), »Einstein« (1974) and »Leonce und Lena« (1979), to name a few. Since reunification the Lindenoper has become firmly established in the musical life of Berlin and once again ranks among the world’s leading opera houses. New priorities were set under the directorship of Georg Quander. A »Berlin dramaturgy« rediscoverd and reassessed important works from the past. Baroque opera took on particular importance with »Cleopatra e Cesare«, »Croesus«, »L’opera Seria« and »Griselda« under René Jacobs with the Akademie für Alte Musik Berlin and the Freiburger Barockorchester on historical instruments. Another musician of long-standing international experience joined the Lindenoper when Daniel Barenboim was appointed artistic director and general music director in 1992. Autumn 2000 saw him elected as lifetime chief conductor by the Staatskapelle Berlin, with which he performed the complete cycle of Beethoven’s symphonies and piano concertos (as conductor and soloist). During the 2002 Festtage he also presented the ten-part Wagner cycle, produced in collaboration with Harry Kupfer between 1992 and 2002. Along with the maintenance of the concert and opera repertoire, the directorship of Peter Mussbach from 2002 to 2008 was marked by new forms of music theatre: numerous premieres and 20th-century works were realised as interdisciplinary projects with artists, architects or choreographers, both on the large stage and and in the Magazin building, which was established as an experimental laboratory for inter-genre projects. In April 2008 the opera director Ronald H. Adler provisionally took on the directorship of the Staatsoper until the artistic director, Jürgen Flimm, took over in September 2010. From 2011 to 2013 Ivan van Kalmthout held the position of the opera director. As of January 2014, Tobias Hasan assumed the position of the head of artistic administration. The Staatsoper Unter den Linden continues its unique programme of concerts and operas, which ranges from Baroque operas in historical performance practice to the central works of the classical, romantic and modern opera literature to the realisation of premieres by contemporary composers. The performances are of the highest musical quality, something guaranteed by the presence of Daniel Barenboim as the general music director and by renowned guest conductors, a house ensemble of first-rate singers augmented by internationally known stars, and, not least, by the Berlin Staatskapelle. The productions reflect a commitment to these works from a modern perspective; they challenge conventional viewing habits, while remaining true to the spirit of the work. During the urgently necessary renovation of the entire Staatsoper Unter den Linden, which began in 2010, the Schiller Theater in Berlin-Charlottenburg served the ensemble as an alternative venue from October 2010 until October 2017. Now all ensembles are back at the main house Unter den Linden. Following public debates about the redesign of the auditorium, the architect HG Merz was commissioned to renovate the historic monument. The ensemble of buildings comprising the Staatsoper is very much in need of a general overhaul. While complying with listed building requirements, structural defects are therefore being remedied and the antiquated building equipment updated in line with modern safety requirements. The accessibility, air-conditioning and fire protection are also being improved. The outer appearance of the opera house will, however, remain the same when viewed from a pedestrian perspective. The volume of the auditorium is being enlarged so as to improve the acoustics. To achieve this, the hall is being expanded upwards within the existing building structure by raising the historic ceiling. The design of the Opera House Unter den Linden will also include the restoration and design of fixtures and colour schemes from 1955. During the construction phase, the State Opera ensemble is performing in the Schiller Theater in the Berlin district of Charlottenburg-Wilmersdorf. The architect Georg Wenzeslaus von Knobelsdorff was commissioned to design the building. He conceived the opera in the Palladian style. The King selected a fortress site near the Kronprinzenpalais where he lived. By placing it on the city’s main axis – the Unter den Linden boulevard – and not as would be usual within the palace complex, this created Europe’s first independent theatre building as a cultural expression of the Enlightenment. After the Staatsoper had already been damaged in 1942 and undergone comprehensive renovation, the massive destruction in the last year of the war led to the decision to rebuild it. Plans became more concrete following the founding of the GDR state in October 1949 and the demolition of the Berlin royal palace. The former Poelzig student and Gropius assistant, Richard Paulick, was asked to produce a design for its reconstruction. The aim was to remove all stylistically incongruous changes that had been made during the building’s history and to reconstruct it in accordance with Knobelsdorff’s intentions. Within three years, Richard Paulick and his “Design Collective” succeeded in making the hitherto most important contribution to the GDR’s cultural renaissance. For example, the Apollo Hall with its ornament inspired by original motifs provides an excellent example of the creative but nevertheless responsible approach to dealing with existing heritage. The auditorium with its three galleries, which is unusually lavish by socialist standards, provides testimony to the cultural assuredness of the early 1950s. The Deutsche Staatsoper opened on 4 October 1955 with Wagner’s “Die Meistersinger von Nürnberg”. The architect Richard Paulick was born on 7 November 1903 in Roßlau (Anhalt). From 1923 to 1927 he studied architecture in Dresden and Berlin, including among others under Hans Poelzig. He also nurtured professional connections with the Bauhaus and worked in the office of Walter Gropius, which shaped his projects. He died on 4 March 1979 in Berlin. Richard Paulick had a turbulent life as an architect. He developed his first designs under the influence of the Bauhaus. As a person with strong political beliefs, he was forced to leave the country in the 1930s and did not return to Germany until 1950, when he settled in the GDR. Here his works have left their mark. In 1956 he was conferred the State Award for the reconstruction of the Staatsoper. From Knobelsdorff to Paulick, many architects have constantly changed the opera house and adapted it to meet new challenges and functions. And that is still happening today: with considerable constructional commitment and expertise, the opera is being optimally redesigned to create ideal conditions for the public and the opera players. The refurbishment of the Staatsoper with all the measures that are now being implemented will enable the Berlin venue to join the ranks of the internationally renowned opera houses. This will not only expand the production possibilities but will also make Berlin more attractive for tourists from all over the world. Berliners will still recognise their opera house as a familiar venue with the accustomed ambiance and will be able to enjoy the stage productions with improved sightlines and acoustics. The previous structural changes to the building, the social composition of the audience and in particular the musical performances have always been accompanied by changes in the acoustic qualities. The redesign of the Staatsoper is indeed to meet the new requirements. The reason why the design now being implemented is so convincing is because it presents the optimum solution at the end of a discussion process. It takes into account the historic appearance but also sensitively articulates where something new has been created. WHAT DO THE INDIVIDUAL BUILDING SECTIONS SOUND LIKE? The overall project encompasses 5 building sections: the opera house, which is divided into the auditorium and the fly tower, the “Intendanz” administration building, the rehearsal centre (on the site of the former “Magazin” storage building) and the underground link for moving scenery. This will enable a more efficient logistics for the Staatsoper’s repertoire operations. Waterproofing has been installed here to protect against groundwater. Decorative and historically protected fittings and furnishings have been freed of diverse contaminants, carefully catalogued, and put into storage. In terms of its design, the building is returning to Richard Paulick’s design vocabulary of the 1950s. Here the stage equipment was first of all disassembled and the building secured with anchors to prevent it from floating upwards. Steel sheet waterproofing, which is up to 3 cm thick, was then installed. The principle for this waterproofing comes from ship building. An expert appraiser checks every centimetre of the 7-kilometre-long weld joint to ensure that it is impermeable. The underground link not only enables scenery elements to be quickly transported on trolleys so that they are protected from the weather but also ensures that the various Staatsoper buildings are internally connected with one another in logistical terms. For example, the necessary technical rooms are housed in the underground link. All the supply lines, such as the electrical, heating, cooling and fire extinguishing ducts run through the underground link, which is therefore of particular importance for the Staatsoper’s technical provision. In addition, there are areas available for pre-assembling and storing stage scenery and decorations. Here the decorative and historically protected fittings and furnishings were freed of contaminants, carefully catalogued and put into storage. On completion of the shell construction work in the building (waterproofing, facade and window refurbishment), the repaired decorative elements will be reinstalled. This will provide rehearsal facilities for the State Ballet, the choir and orchestra. A rehearsal space with the same dimensions as the main stage in the opera house will also be created here. This is where the Staatsoper ensemble will have their first opportunity to rehearse with the original scenery and the same stage size as in the opera house. The room can also be used as a second performance venue. The facade of the previous storage building will be reconstructed. The previous auditorium achieved too little timbre and, when occupied, achieved a reverberation time that was too short. This low value was caused by two factors: firstly the ratio of the low room volume to the number of audience members, and secondly the absorption of the high frequencies. In addition, the fabric coverings in the auditorium prevented the tones from being reflected. The intention is to therefore lengthen the reverberation time and thus improve the sound. The concept developed by the acousticians and the architects involves raising the ceiling, whereby the auditorium volume will be increased by almost half and the reverberation time can be substantially lengthened. The auditorium ceiling will be raised by 5 metres without changing the exterior appearance of the building. This added height will create a reverberation gallery. A sound-permeable structure has been developed based on the existing lattice and diamond-shape motifs in the building. The Staatsoper Unter den Linden has undergone continual change. As a result, the building, which has been listed as a historic monument since 1979, has a multilayered richness that is unparalleled. The modernisation will mark a further chapter in the history of the opera house. Under the supervision of the architect, HG Merz, the building has been undergoing the necessary general renovation since 2009. It is intended to improve the infrastructure in terms of the accessibility, air-conditioning, safety and fire protection, whereby the outer structure will be preserved and sensitively restored. In the interior space, conservation decisions will be made that achieve a balance between the requirements of a modern theatre venue and historic preservation interests. The auditorium is being restored from the front stalls to the gallery, and the colour scheme from 1955 is being recreated. Subsequent layers of paint will be removed, revealing the complete work of the architect Richard Paulick. Above the circles and gallery, the historic auditorium ceiling will be raised. As the new termination above the existing building fabric, a cornice will be created that develops out of the existing entablature. Barrier-free access will be achieved in the public parts of the building.